These new varieties were previously introduced as special editions but are now being introduced as permanent varieties of the filled sandwich range. These two varieties were considered a huge hit when both were still marketed as special edition filled sandwiches. 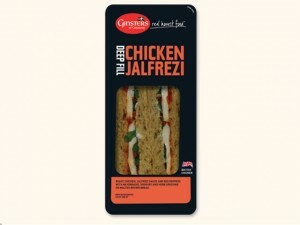 Ever since it was introduced to the market, even as a special edition product, the “Chicken Jalfrezi” variety has always been a favourite among sandwich lovers, primarily because of its new and unique flavor. This variety is made by combining roast chicken, red peppers, mayonnaise, Jalfrezi sauce, herb dressing and yogurt. The second new variety, “deep fill cheddar and bacon”, is made by combining British farmhouse aged cheddar cheese, tomato, mixed leaves, and sweet cure-smoked bacon. This variety aims to offer consumers with a more generous meat and cheese sandwich, which very few food companies, to none, have yet to offer. According to Ginsters’ head for Brand Marketing, the two varieties have been added as permanent flavours to the filled sandwich range because both were able to perform excellently in the market. In fact, the two varieties accounted for more than 50% of the company’s sales when it came to their sandwich range. The company is confident that it will be able to expand its consumer appeal, as well as give retailers food products that genuinely appeal to customers. The two new additions to Ginsters filled sandwiches are now available in major retail stores all over the country.